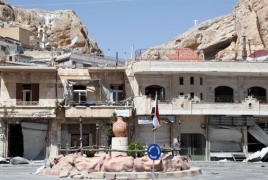 PanARMENIAN.Net - Militant rebels in southwest Aleppo launched a new attack on the provincial capital, hitting a densely populated district, Al-Masdar news reports. According to a military report from Aleppo city, the militants of Hay’at Tahrir Al-Sham launched a number of missiles into the New Aleppo District on Wednesday evening. A source from the Syrian Arab Army (SAA) said the attack was unprovoked as their forces had avoided hostilities with the militants for much of the week.